It’s clear that YouTube and video marketing is here to stay. And for good reason! You can quickly capture attention, build brand awareness, educate, entertain, provide inspiration and influence your prospects to take action…all using video! Plus, when leveraged successfully, video can also help you get top rankings in the search engines. 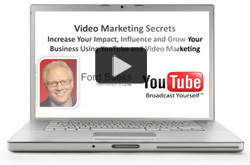 Get the simple strategies and tactics to leveraging YouTube and video marketing with Ford Saeks’ 90 minute online video training!